The Russian Defense Ministry has denied media reports its aircraft hit hospitals in Syria, saying the medical facilities mentioned by Western media don’t actually exist. The Defense Ministry has checked the data presented in recent media reports, which blamed Russian aviation for hitting several hospitals in Syria, Major-General Igor Konashenkov, the ministry spokesman said in a press briefing on Monday. Out of six hospitals that were mentioned in the reports, only one medical facility actually exists in real life, he added. "We’ve checked this information. It turned out that, a hospital is only present in the village Sarmin,” the spokesman said, adding that there are no hospitals and no medical workers in the other five villages named in media reports. The Defense Ministry presented a photo of the Sarmin hospital, which was taken on October 31 after the reports emerged. The image showed the building was intact, disproving claims it had been completely destroyed and 12 people killed. Reports in several Western media outlets on October 21-23 claimed that 12 people, including doctors, were killed in a Russian airstrike on the village of Sarmin in Syria’s Idlib province. They also said medical facilities were hit in al-Eis, al-Hadher, Khan Tuman, Latamna and al-Zarba. The Russian Air Force has performed 131 sorties over the last two days, hitting 237 terrorist targets in various Syrian provinces, Konashenkov said. 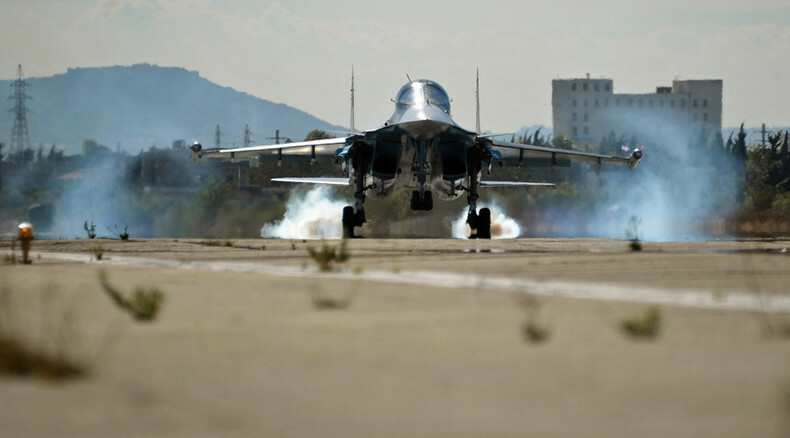 “131 sorties were carried out from the Hmeimim airbase, during which 237 terrorist targets in Hama, Latakia, Homs, Damascus Aleppo and Raqqa provinces were hit,” Konashenkov said. In Homs, Russian warplanes have destroyed underground shelters and anti-aircraft artillery positions of Islamic State (IS, formerly ISIS/ISIL). “In Tadmor district of the Homs province, an Su-25 attack aircraft struck an IS fortified area. As a result of the direct hit, fortifications, underground shelters and terrorist anti-aircraft artillery positions, which hosted two ZSU-23 systems, were destroyed,” Konashenkov said. According to the spokesman, another Russian airstrike wiped out a Jabhat al-Nusra command center in Latakia province, which the jihadists used to suppressed radio communications by Syrian government forces. "In the suburbs of the city of Aleppo, an Su-34 bomber struck a camp used for training militants arriving from foreign countries. The air bombs completely destroyed an arms depot as well as the terrorists’ training infrastructure,” Konashenkov said. Russia began a large-scale air campaign against Islamic State, Jabhat al-Nusra and other the terrorist groups in Syria on September 20. Dozens of sorties are carried out by Russian warplanes every day at the official request of the Syrian government.